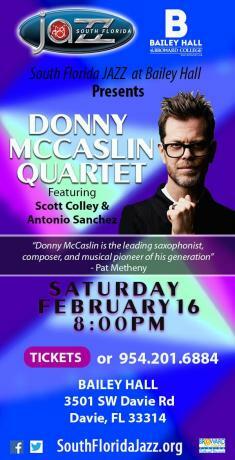 Saturday, February 16, 2019 - 8:00 p.m.: South Florida JAZZ, the area's premier jazz organization, in partnership with Bailey Hall, continues its 27th season of presentation, and the second season of "South Florida JAZZ at Bailey Hall," with the Donny McCaslin Quartet. Mr. McCaslin is rising-star tenor saxophonist propelled to prominence by his Grammy-awarded collaboration with the late David Bowie. He is making his first South Florida appearance with this concert. 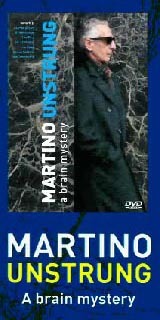 The three-time Grammy nominee is the leading saxophonist, composer, and musical pioneer of his generation, receiving wide commercial and critical acclaim in jazz, and even rock and electronica circles alike. Raised in Santa Cruz, California, McCaslin attended Berklee College of Music, where in his senior year he would join NEA Jazz Master Gary Burton's quintet. Moving to New York in 1991, he quickly made a name for himself as a first-call soloist and touring musician, working with Maria Schneider's orchestra, Dave Douglas, Danilo Perez, Brian Blade, Gil Evans project, Steps Ahead, and many others. During this period, he also released several albums under his own name while receiving critical awards such as a Chamber Music of America's New Works Grant in 2006 and DownBeat Critics Poll ‘Rising Star' category in 2008 and 2009. Named "one of the hottest jazz tickets in the world" for 2017, recent awards included Best International Jazz Artist at the 2017 Jazz FM Awards in London and the prestigious Paul Ackett Award from the 2017 North Sea Jazz Festival. The Donny McCaslin Group has performed over 80 shows on 5 continents each of the past two seasons in support of his hit recording, Beyond Now. Bailey Hall is located on the A. Hugh Adams Central Campus at 3501 SW Davie Rd. in Davie and offers free parking. Season subscriptions and individual tickets are available by visiting southfloridajazz.org or baileyhall.org or contacting the Bailey Hall box office at (954) 201-6884. The box office and phone lines are open Monday through Friday from noon to 5 p.m.; Saturday from 7:00 p.m. until curtain time.